India is the land of religion. Max Weber described the everyday life of the Indian masses as taking place within an “enchanted garden of life” formed by charismatic gurus, characterized by the unbroken belief in magical powers of irrational efficacy, and devoid of an escape to a rational, this-worldly way of life (see Weber 1963: 369-370). Even in the 21st century, India seems entirely preoccupied with religion, spirituality, magic and miracles. Well, not entirely…. India is not only a land of religion, superstition and blind beliefs, but also of atheism, rationalism. humanism, scepticism and agnosticism. It is a land of enlightenment, philosophical quest for truth and practical application of [rationalistic] principles for common good. It is the birthplace of the Buddha and Mahavcera, and also of Charvakas and Lokayatas and Samkhya philosophy. In the Middle Ages, Saint Kabir challenged the idol worship and strove for national and social integration…The dawn of the modern Age was accelerated by outstanding social reformers like Raja Ram Mohan Roy, Mahatma Phule, Ishwar Chandra Vidya Sagar, Kesav Chandra Sen, Pandita Ramabai, Mahadeo Govinda Ranade, Maharshi Karve, Kandukuri Veersalingam and many others who brought a new awakening among people and heralded a new era… Similarly, Bharat Ratna Dr. Baba Saheb Ambedlear led an uncompromising struggle against caste system and untouchability. It was Jawaharlal Nehru who spearheaded the struggle for modernisation and secularisation and strove incessantly for promotion of scientific temper and humanism. Periyar, EV Ramaswami, MN. Roy, Gora and Abraham Kovoor were the architects of the atheist, humanist, rationalist and freethinker movement in modern India. This statement by G Vijayam, the executive director of the Atheist Centre in Vijaywada (Andhra Pradesh) gives an insiders perspective on the roots of the contemporary atheist, humanist, rationalist, and freethinker movement in India. This book addresses this genealogy through an extensive historical overview that engages with the rationalist’ s own perspective on their roots in ancient Vedic times and the importance of the Bhakti movement . Further the embedding of contemporary rationalism in the religious and social reform movements of the 19th century India as well is as the influence of anti-religious organization of the 19th century England are discussed. Based on one year of ethnographic fieldwork this book also discusses the aims, activities, and criticisms of the organization Andhashraddha Nirmoolan Samiti (ANiS – Organisation for the Eradication of Superstition) in Maharashtra. At the core of this case study lies a “thick description” of the way in which ANiS activists try to spread scientific temper and eradicate superstition, an analysis of their profile and agenda, as well as an engagement with the way in which rationalistic worldview influences the everyday life of the rationalists. 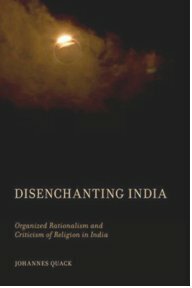 On this basis it is argued that the main characteristic features of organized rationalism in Indian can be described as consisting of a specific “mode of unbelief”. In addition, the relationship between organized rationalism in India and like-minded groups in the West is addressed. By contextualizing the Indian rationalist movement in a transitional and trans-cultural perspective, this book addresses the way in which groups like ANiS can be seen contributing to a wider international movement that advocates a secular, materialistic, and naturalistic worldview. This contextualization of Indian rationalism ends with a discussion of the interconnections between rationalism, as understood by the Indian rationalists and rationalistic positions within socio-political debates in India , as well as international academia. This book contributes empirically as well as theoretically to a field of study that has widely been neglected in the cultural sciences. The spectrum of non-religiosity and unbelief in India, from religious indifference to outright criticism of religion(s). Empirically, it is particularly significant that, in the case oh India, very little serious academic work has been done on antireligious movements. This is largely because scholars of India tend to as an anonymous reviewer for this book put it, concentrate on the mans religions of India under the frequently unchallenged assumption that Indians are ‘notoriously religious’ (to paraphrase what the African scholar J.S. Mbiti said about African societies). This predilection for studying the religions of India has led to a death of scholarly material exploring popular rationalist and atheist groups in India of which ANiS is an important example. One major theoretical contribution of this book to the study of organized rationalism, unbelief and criticism of religion(s) is the notion “mode of unbelief” On the one hand, the distinguishing characteristics of rationalist organizations like ANiS are summarized under this rubric. This analysis, on the other hand, goes beyond the specific characteristics of the Indian rationalist movement by building theoretically upon the notion “modes of religiosity” as established by the historian of religion Ulrich Berner. It is argued that it is more fruitful to compare specific modes of religiosity and unbelief rather than opposing religion or religions and atheism or non-religion. This approach challenges standard analytical approaches towards religion(s) by allowing new systematic descriptions and comparisons of different modes of unbelief and modes of religiosity, undermining thereby the abstract opposition between religion and atheism or religiosity and unbelief. The books’ second theoretical focus connects to the classic discussion of secularism and modernity begun by the work of Max Weber and continuing to the contemporary debates on Charles Taylor’s magnum opus A Secular Age (2007). This includes a discussion of Weber’s differentiation between the concepts “rationality”, “rationalism”, and “rationalization” as well as a critical analysis of Weber’s master narrative of “disenchantment” as applied and situated in a particular analytic framework by Charles Taylor. This book thereby contributes to the extensive debates triggered by the publication of A Secular Age, especially on the blog “The Immanent Frame” of the American Social Science Research Council (SSRC) with initial contributions from Talal Asad, Robert Bellah, and Charles Taylor himself. This ethnography of organized rationalism in India is, finally, situated in the contemporary debates about the general nature of rationalism in Indian intellectual life and cultural politics. The empirical and theoretical contribution of this book are thereby contextualized in contemporary debates that take place within Anthropology and Religious Studies, as well as Postcolonial and Global Studies, Sociology, and History. Most important here is the postcolonial critique of “scientific rationalism” as made explicit, for example, in numerous publications by Ashis Nandy (1988, 1989, 1995, 2004), in books like Provincializing Europe (2000) by Dipesh Chakraharty or Another Reason (1999) by Gyan Prakash or, for that matter, in postcolonial writings on and from other parts of the world (see, e.g., Alcott 2007). In opposition to these positions there is also a prominent defense of scientific rationalism as outlined, for example, in Meera Nanda’s Prophets Facing Backward (2006a) and many of her other publications (2002, 2003a, 2003b, 2005a, 2006b). This line of argument resembles the position taken by Allan Sokal in the so-called Science Wars. Sokal himself contributed to the debates in India (1998, 2000 and 2005). It is argued that scholars like Nandy and Nanda, at the same time, address the aims and activities of groups like ANiS, socio-political questions relevant to the wider Indian society, as well as issues central to contemporary debates in the cultural sciences within which they represent opposing academic positions (for an overview see Maffie 2005 and Rajana 2005).Rationalism as understood and applied by Indian rationalist groups is therefore to be understood as embedded in and interconnected with the debates about rationalism inside as well as outside the realms of cultural politics and academia. The first part of this book introduces Indian rationalists as well as the main theoretical questions raised, and ends with a short outline of the fieldwork conducted and methods applied. In the second part I give an overview of the history of the Indian rationalist movement and the rationalists’ emphasis on maintaining links to ancient India alongside its modern European roots. At the heart of the book is the third part, in which I describe and analyze the aims and activities of the rationalists in India through an ethnographic case study of ANiS. I conclude in the fourth part with a discussion and a detailed description of the specific mode of unbelief of ANiS activists which explains their motivation and exemplifies the distinguishing characteristics of the Indian rationalist movement. In the epilogue, the main arguments of the book are extended by raising questions that go beyond the remit of the ethnography and address general issues connected to researching rationalism.